It was actually political developments in Europe that led to Dutch ambitions in the Malay archipelago. Portugal's days of glory and its Age of Discovery were coming to an abrupt end. By the 1550s, the economy was already in steep decline. 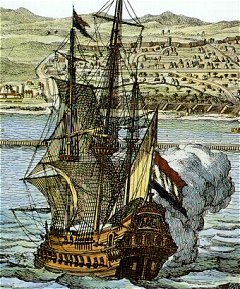 Portugal's intolerant attitude towards its conquered peoples and their neighbours meant that its colonies were constantly in need of fresh supplies weapons, ships and men - supplies the small country just did not have. Due to greed, corruption, and mismanagement in its overseas possessions, even the cost of administrating colonies and running trading posts abroad could not be met. The Inquisition finally brought an end to the years of exploration, expansion and exuberance. A crushing defeat at the hands of its Muslims foes, the Moors, in 1578 further weakened the Empire and the Portuguese finally suffered the humiliation of falling under Spanish rule. 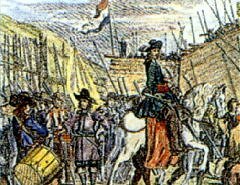 At the same time, in 1581, the Protestant Dutch provinces were in open rebellion against their Catholic masters in Spain and they fought the Eighty Years War in their bid to establish Republic of the United Netherlands (de Republiek der Verenigde Nederlanden). Portugal itself became dragged into Spain's many religious wars with the Protestant nations of Europe. The Dutch felt that the capture of Portuguese outposts and trade in Asia would be an important second front that would lead towards the eventual defeat of the main enemy, Spain, and they established the Dutch East India Company (Verenigde Oost-Indische Compagnie, VOC), in 1602. Even after Portugal gained its independence from Spain in 1640, Dutch power and influence had already grown considerably in Southeast Asia, and the Portuguese enclave in the strategic Straits threatened Dutch naval supremacy. From the view point of trade,. the Dutch considered the conquest of Melaka essential - Dutch commercial policies were based on the principle of monopoly, and the existence of trade emporiums outside Dutch control worked against this strategy. The Dutch tried to establish one such monopoly on tin and early Dutch efforts in the Malay Peninsula were concentrated on securing a firm control of the tin trade on the west coast. The presence of the Portuguese made this difficult. The logical solution to the problem was the capture of the port, and this was achieved by the Dutch in 1641, with the active help of the city's former rulers the Johor Sultanate. The Dutch adopted their traditional policy of signing treaties with the Malay tin-producing states, followed by the setting up of fortified trading posts or factories, as they were called. The treaties were signed in rapid sequence: Naning signed a treaty with the Dutch in 1641, Kedah in 1642, Junk Ceylon in 1643 and Bangeri in 1645. But these treaties brought little benefit to the Dutch, for much of the tin trade was still in non-Dutch hands. The Dutch at times resorted to sterner measures - building straegic forts and imposing naval blockades - but the monopoly of the tin trade proved elusive. However, Dutch relations with the Malay powers were more fortunate than the Portuguese. Like the Portuguese, the Dutch had no enthusiasm for territorial conquest in the Peninsula and only sought Melaka as a means to control the Straits. But they did have much stronger naval power and the Dutch were far more successful in dominating the Straits than the Portuguese. In their attitude towards Melaka, the Portuguese and the Dutch differed radically. While the Portuguese tried to make Melaka the centre of their Southeast Asian trade, the Dutch reduced Melaka to the position of just a western outpost of their wider Indonesian empire and they redirected much of the trade towards Batavia. In the field of religion, the Portuguese were zealous in their hatred of Muslims and aggressively converted their subjects to Catholicism. The Dutch, on the other hand, were not interested in an aggressive policy of conversion, and generally did not interfere with local customs and practices. 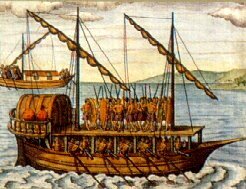 The major Malay powers which had harassed the Portuguese in the sixteenth century were also now on the decline. The Dutch were already waging successful wars of conquest against the Javanese states in their bid to secure the island. The power of Acheh was already rapidly waning throughout the region. Johor entered into a ruinous war with the Sumatran state of Jambi in 1666 - a war which ended in the destruction of the Johore capital at Batu Sawar in 1673. Court intrigues, and disputes over succession to the throne further undermined the vitality of Johor. Later in the eighteenth century, Johor became an easy prey to Bugis infiltration. For the Dutch, the decline of these powers meant greater security for their own stations and naval attacks and blockades on Melaka no longer took place with the frequency, intensity and scale of the Portuguese era. Friction between the Dutch and the Malay States was quite common but it did not assume threatening proportions. For example, in 1651 the Dutch factory in Perak was destroyed by the Malays, and this was followed by a short period of hostilities, before a peace treaty was signed in 1655. The situation, however, was radically transformed in the eighteenth century, largely because of the arrival of the Bugis. 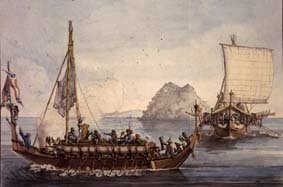 Originating from Sulawesi, the extension of Dutch power over their islands in the seventeenth century led to Bugis migration overseas, and they came to establish settlements in various parts of the Malay Archipelago. In the Malay peninsula, Bugis settlements were concentrated on the west coast. By the beginning of the eighteenth century, the Bugis presence was strong enough to become a major influence in Malay politics. Within a few decades, Bugis power became significant in Selangor, Kedah, Perak and Johor - much to the detriment of the Dutch trade. In. 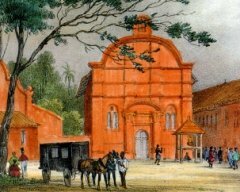 1756, the Dutch in Melaka made the first determined effort to stop the growth of Bugis expansion but the war brought no conclusive result. Bugis influence continued to be dominant, and Riau became their new base, not only for naval operations but also for trade, which successfully encroached on Dutch monopoly. The Dutch in Melaka were now being politically and commercially isolated from the rest of the Malay Peninsula. The Dutch realised the danger, and in 1782 waged a full-scale war against the Bugis. The Bugis were uprooted from their entrenched positions and the fall of Riau in 1785 marked the collapse of Bugis power in the peninsula. But events in Europe ensured that Dutch supremacy there was short-lived. With the outbreak of the Napoleonic Wars in Europe, Dutch possessions in Asia, including Melaka, passed into British hands. The foundation of Penang in 1786 and of Singapore in 1819, strengthened British influence in Malaya, and this influence was formally recognised in 1824 with the signing of the Anglo-Dutch Treaty. By then, it was only the British who were left to wield colonial power in the peninsula.